We love to cook. Just like you. We also believe that delicious recipes depend on great cookware. Our stainless steel mixing bowls are safer and easier to use than heavy glass or ceramic bowls, which slide around and shatter when dropped - ruining recipes and leaving glass shards all over your kitchen floor. 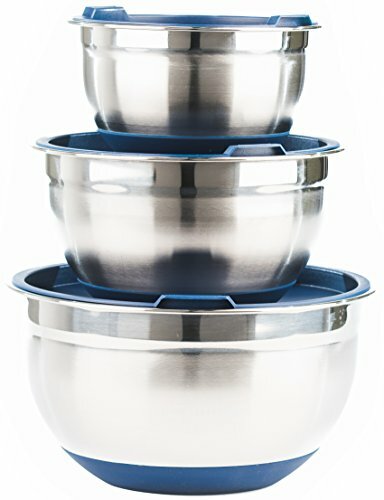 These steel mixing bowls with lids are lighter, nearly indestructible, easily cleaned, and won't retain food odors and stains like melamine or plastic. They also look great in both the kitchen and dining room with stylish brushed steel exteriors and a polished interior finish. Tight sealing, BPA free bowl covers keep food fresh and make it easy to transport your creations to a dinner party or potluck. Anti-slip silicone rubber bottoms grip the counter and stop bowls from sliding during heavy use - great for baking with kids! A comfortable, extra wide rolled lip and easy-grip collar give you exceptional control when mixing or pouring. Stackable lids and bowls save space in your cabinets and accurate measuring marks on the inside of the bowls in both liters and quarts make it easy to scale up your favorite recipes. Our stainless steel mixing bowl set is dishwasher and freezer safe. Lids should be hand washed or washed on the top rack of the dishwasher on low heat. To get a tight seal, press down firmly in the center of the lid to close. This will "burp" out the air and ensure a great fit. If you have any questions about this product by Fitzroy and Fox, contact us by completing and submitting the form below. If you are looking for a specif part number, please include it with your message.